As our saddlespan corporate marquee hire stock forms a modular system, we can design a structure combining the Single, Duo and TriSpan modules to create the perfect configuration for your event. If you are new to the SaddleSpan range we also have a handy SaddleSpan Guide. 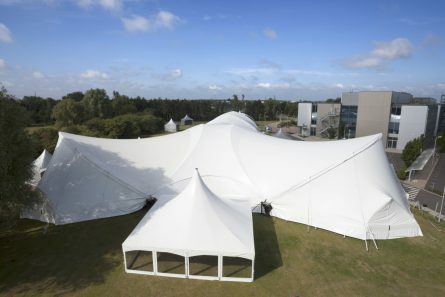 Our corporate marquee hire solutions have all the features that you’d expect. They are all fully close-able allowing for total protection from the elements and effective space heating, and 100% opaque providing total light control at any time of day. 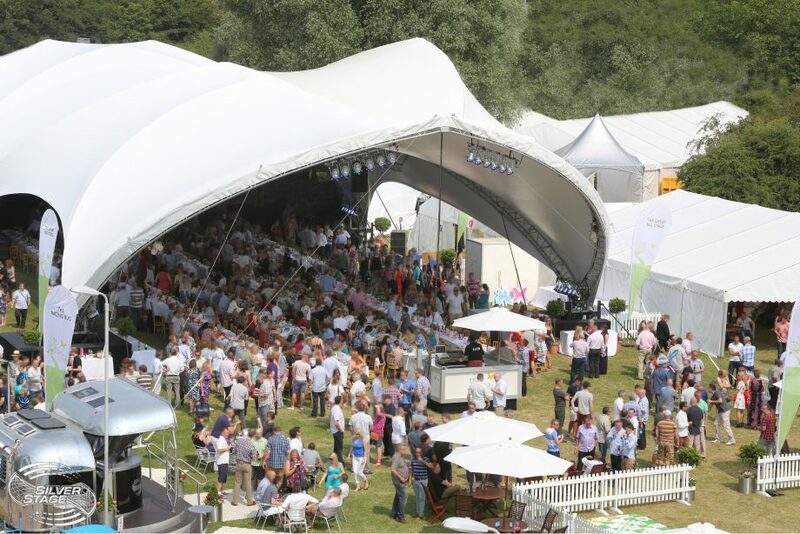 If the weather is good for your event we can simply open the doors and remove infill panels to create the perfect sun canopy, at the same time as allowing the breeze to cool your guests. All of our structures are clearspan, meaning that the internal space is completely clear of pillars and obstacles giving the space a large open feel and allowing for flooring to be easily installed. The modular truss framework of our SaddleSpans allows us to combine any number of SingleSpan structures, using our duo and tri joiners, to create a huge capacity of up to 10,000 people. Silver Stage’s countless MultiSpan configurations are highly functional, providing ample space for multiple stages, huge banquet halls, vaulted assembly rooms and multiple-area exhibition spaces. Popular options include 5V, 4Y and Septaspan. Our colossal 5V configuration was used to create a stage at Glastonbury music festival and provided cover to some 5,000 revellers. 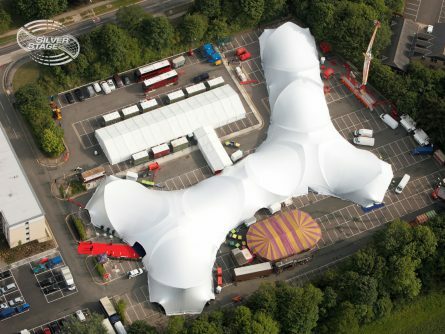 Our 4Y and Septaspan Structures have both been deployed for corporate events for up to 7,000 people, further demonstrating the capacity of these incredible structures. The options are endless. Contact us for a no-obligation quotation, tailored to your needs. 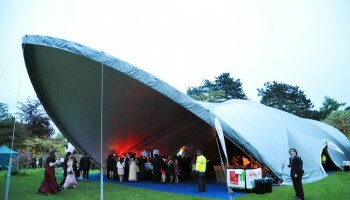 Silver Stage provided us with a spectacular Duo structure for our May Ball. Their service was professional, and we are using them again this year for something even more stunning.